The Regency Chess Company was formed during the summer of 2008 as a new and exciting online chess retailer. Since then we have managed to develop a well known and respected brand of chess products while achieving an excellent record in customer service. Since 2008 the company has seen year on year growth. The success has been down to a solid commitment to product quality, excellent customer service and the ability to present our wonderful products online in the most professional way. Our product range has never stopped growing, it seems that no sooner do we add a new range of products to our site, that we become the industry leader in the product line in question. In 2010 for example we began to sell a range of backgammon sets. This allowed us to nearly double our sales worldwide and we are now one of Europe's foremost retailers of backgammon sets. 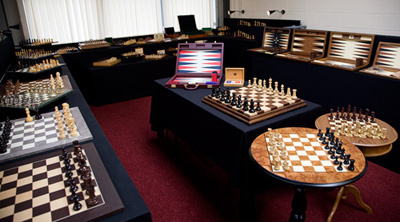 The Regency Chess Company is based in Somerset in the United Kingdom. Our massive selection of products is all stocked in our European central warehouse facility and are available for immediate shipping to any worldwide destination.